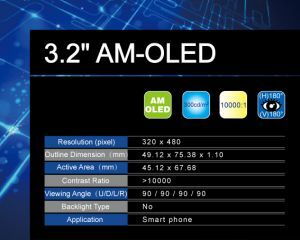 Last week we reported that Tianma is showing a 12" AMOLED prototype at FPD China 2012. It turns out that the company unveiled two panels (3.2" and 12") and they kindly sent us a couple of slides showing details about these panels. 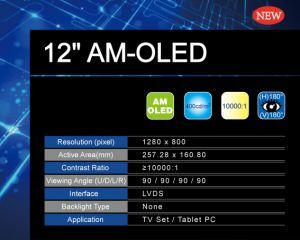 The 12" panel features 1280x800 resolution, 400 cd/m2 brightness and a contrast that exceeds 10,000:1. It is aimed towards TV and tablet applications. The second panel is 3.2" in size and features 320x480 resolution, 300 cd/m2 brightness and the same contrast. It is aimed towards smart phone applications.